Roast sesame seeds and peanuts separately. Grind roasted peanuts coarsely and keep it aside. Grease one plate with little ghee. Heat 1 tbsp ghee in a pan on low heat. 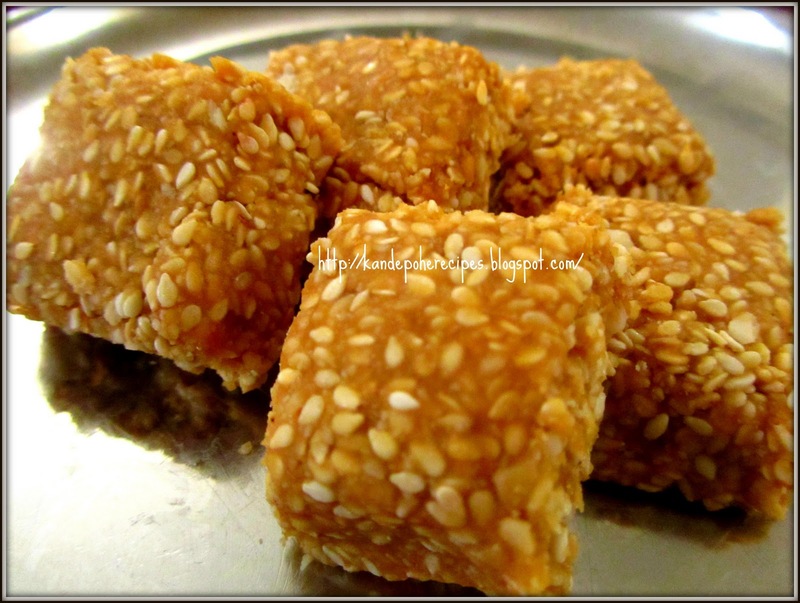 Add jaggery and keep stirring till jaggery turns into a smooth paste. It will take around 4-5 minutes. Switch off the heat and add 2 tsp of water. Mix well. Add ground peanuts, sesame seeds, cardamom powder and nutmeg powder. Mix all ingredients and pour the mixture immediately on a greased plate. Spread the mixture evenly by pressing it little bit. Let it cool down. After 10 minutes, cut it into desired shapes using knife. Store them in a air tight container. Feel like having some,extremely irresistible. My colleague had brought this yesterday and I jut loved it..and there you are with the recipe :-) thank for sharing.